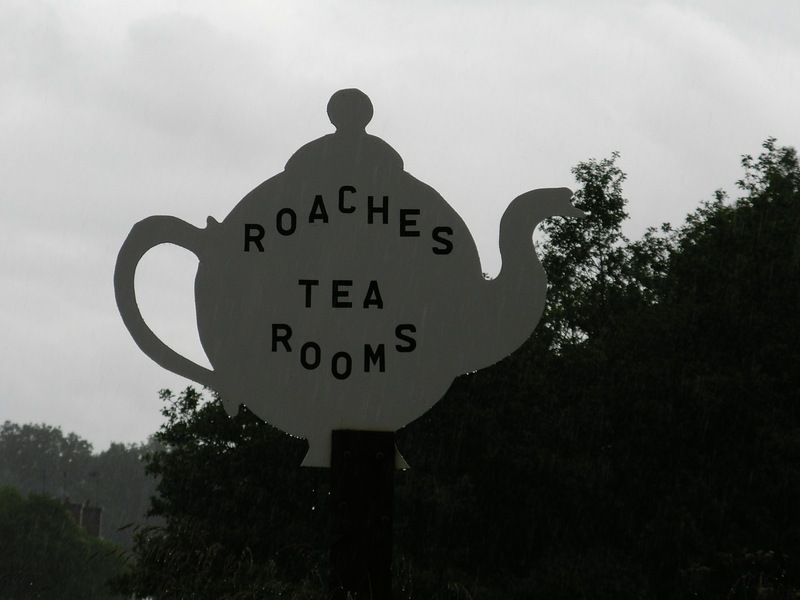 The Roaches Tea Rooms & Holiday Cottages are situated just off the Leek to Buxton Road (A53), 3½ miles north of Leek in Staffordshire. The AA Route Planner or Multimap or see below. From A53: -Turn left at the fork; we are 1/2 mile from there. Proceed over the small bridge and through the old engineering works. Continue up the hill past the Farms towards the Roaches. The Roaches Tea Rooms & Holiday Cottages at Paddock Farm can be found on the left hand side just after the 'restricted parking' signs. There is ample parking facilities for visitors. Travelling from North on M6 - Exit Junction 17 to Congleton on A54, then A523 to A53. Travelling from South on M6 - Exit Junction 15 to Stoke-on-Trent on A500 to A53. Travelling from North on M1 - Exit Junction 30 to Chesterfield on A619, then A6 to A53. Follow the signs for Buxton on A53. Travel for about 3 miles, passing through Blackshaw Moor on a long straight road, watch out for the potential mobile Speed Camera. On leaving Blackshaw Moor 50 mph limit take the left turn to ‘Upper Hulme’ just after the ‘millstone' Peak Park entrance sign. Look out for the White Teapot. Turn left at the fork. Proceed over the small bridge, past the engineering works, continue up the hill past the Farms towards the Roaches. The Roaches Tea Rooms & Holiday Cottages at Paddock Farm can be found on the left hand side just after the 'restricted parking' signs. There is ample parking for visitors. 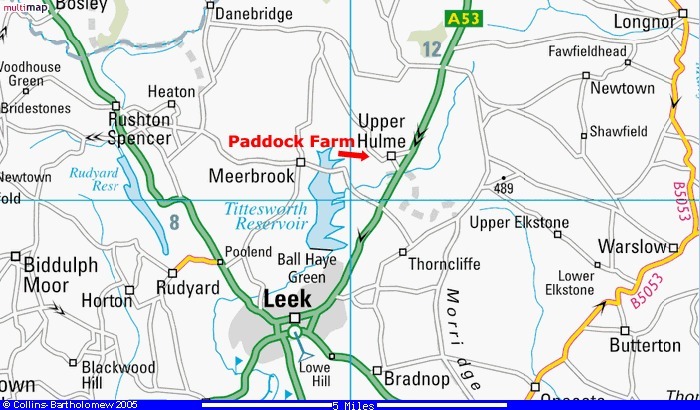 Follow the signs for Leek on A53. After travelling for about 9 miles, crossing the Staffordshire border, continue through Quarnford and past the Winking Man Pub on the left hand side. You will then descend a long steep bank. Just before you reach the 50 mph limit at the bottom turn right to Upper Hulme. NB. take the second right, not the first. Look out for the White Teapot. Turn left at the fork. Proceed over the small bridge, past the engineering works, continue up the hill past the Farms towards the Roaches. 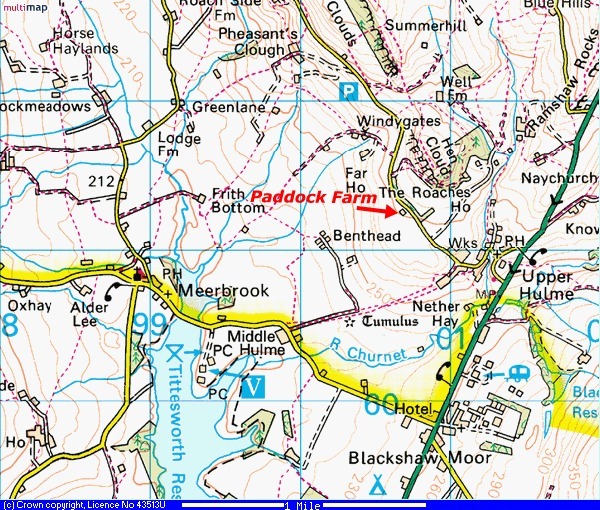 The Roaches Tea Rooms & Holiday Cottages at Paddock Farm can be found on the left hand side just after the 'restricted parking' signs. There is ample parking for visitors. National Rail website has information on timetables and prices at www.nationalrail.co.uk or The Trainline. A taxi journey from Stoke-on-Trent main-line station to the Roaches takes about 35 minutes, from Macclesfield about 25 minutes and Buxton is about 15 minutes. If you travel by bus you will need to take the bus or coach to Hanley Bus Station and change there for Leek. Details of bus or coaches can be found at www.nationalexpress.com. Once in Leek you need the 118 to Hanley to Buxton via Leek, alighting at the Three Horseshoes Inn which is about one mile away. Please click on link for the Bus Timetables.